The following resources have been produced by CADRE partners and/or DRK-12 PIs with support from CADRE. They provide information on the research that is currently funded, the variety of instruments and methodologies in use, and strategies for effective partnering, dissemination, and knowledge use. 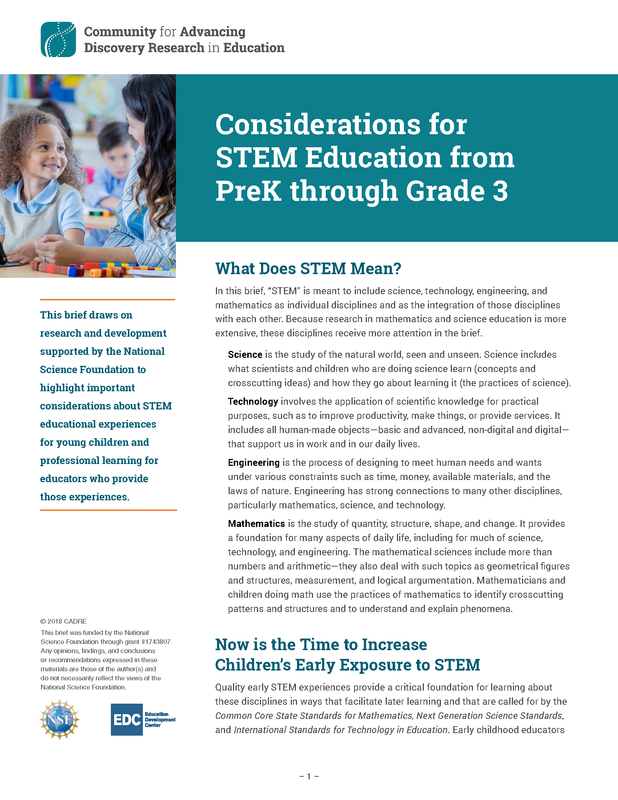 This brief offers insights from National Science Foundation-supported research for education leaders and policymakers who are broadening participation in science, technology, engineering, and/or mathematics (STEM). Many of these insights confirm knowledge that has been reported in research literature; however, some offer a different perspective on familiar challenges. This paper seeks to provide a resource for prospective DRK-12 awardees by identifying some of the theories that current and recent DRK-12 awardees are using in their research on broadening participation. DRK-12 awardees discuss the impact of education research in this CADRE-produced video. 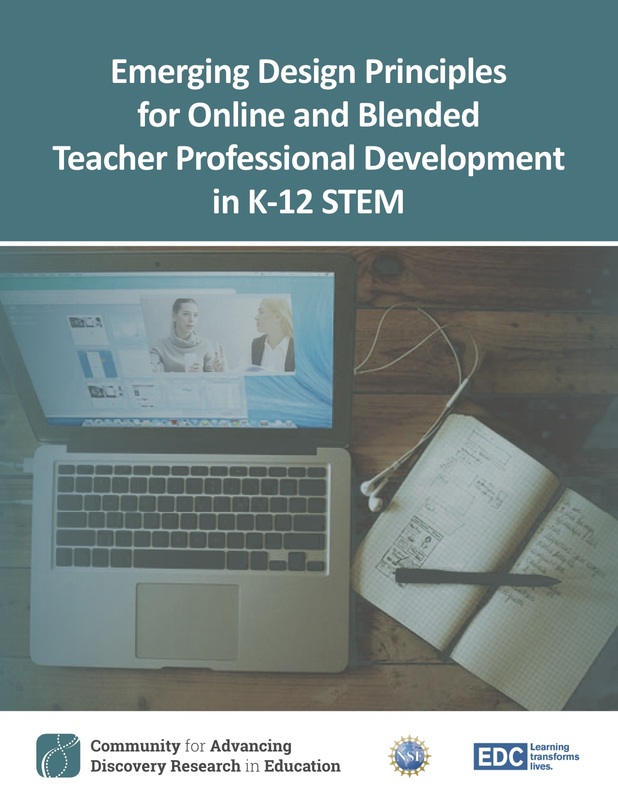 Between February and September 2017, awardees representing 11 projects participated in a series of activities designed to elicit and form consensus around emerging design principles for online and blended teacher PD programs in K–12 STEM education. The resulting principles are organized and presented around three themes in this report. In this brief, CADRE has compiled tips on preparing and submitting NSF project reports—annual, interim, final, and product outcome reports. 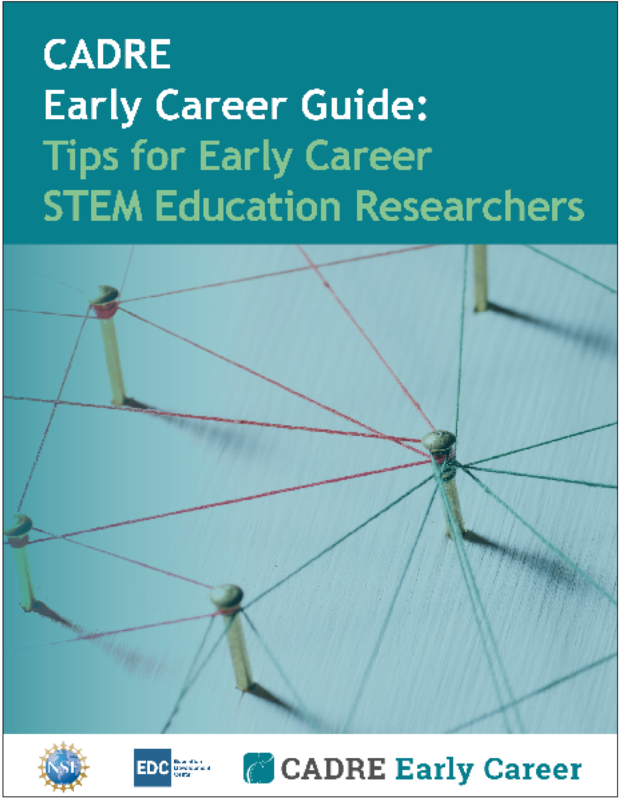 The CADRE Early Career Guide offers advice from experienced DRK-12 awardees on becoming a successful researcher in the field of STEM education. The guide also profiles a support program, the CADRE Fellows, for doctoral students in STEM education research. This report presents key findings from a keyword survey administered in 2017 to the principal investigators of the CADRE Discovery Research PreK–12 (DRK–12) program during the fall of 2017. The survey asked respondents to select keywords that described their projects’ target audiences, foci, research, and evaluation. This article examines whether funding provided through the National Science Foundation’s (NSF) Discovery Research K-12 (DRK-12) program has made a unique contribution to the research in the fields of science and mathematics education for ELs. This brief explores factors that contribute to opportunity gaps in STEM education based on race, ethnicity, gender, ability, and socioeconomic status. 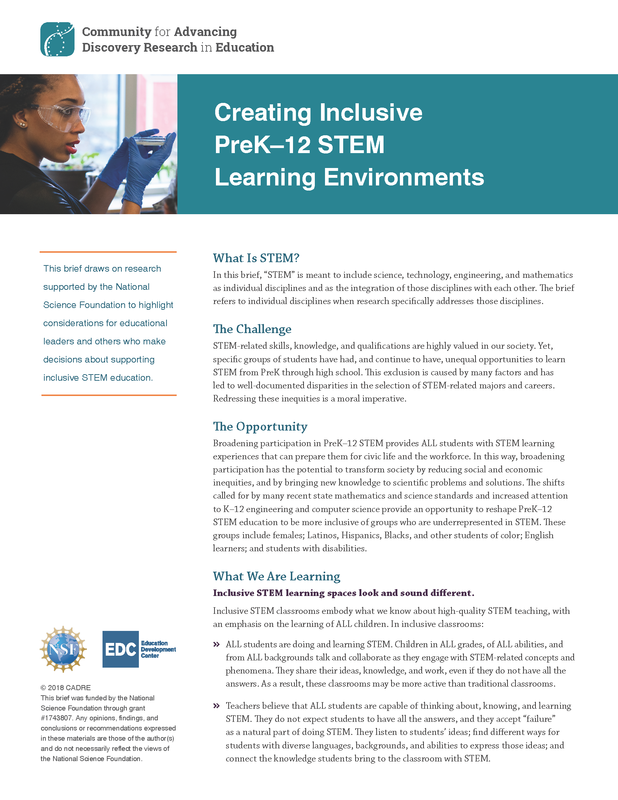 It showcases the work of several DRK-12 projects and describes promising approaches for removing barriers for underrepresented groups and enhancing the STEM learning of all students. This resource provides guidelines that may help new mentors and mentees establish an effective and productive relationship. This CADRE brief describes the need for effective mentoring relationships and examines elements of good mentoring practices based on a growing body of literature from the field. The future strength of the National Science Foundation’s (NSF) K-12 education research and development efforts depends in part on the development of promising early career researchers and developers—including doctoral students, post-docs, and first time principal investigators (PIs)—who can grow into R&D leaders and form an impactful R&D workforce. This brief promotes deliberation on how to improve support and guidance for early career researchers and developers in the DRK-12 program, as well as in the broader field of STEM education R&D. In recent years, there has been increasing recognition and exploration of the potential for technology resources such as games and simulations to support science and math learning. With the growing attention to these types of educational technologies, the Community for Advancing Discovery Research in Education conducted a brief targeted study to better understand the gaming and simulation research and development work being funded within the NSF’s DRK-12 program and to highlight the innovative programs, models, and resources that may contribute to these fields. Because engineering education is drawing increased attention from STEM policy-makers, it is an opportune time to take stock of the current status of ongoing innovation in K–12 engineering education; therefore, the Community for Advancing Discovery Research in Education (CADRE) conducted a brief targeted study to investigate the work that is being funded in K-12 engineering education within NSF’s Discover Research K–12 (DRK–12) program. Improving STEM education in the United States is a priority expressed by policymakers, practitioners, and business leaders. This brief describes the innovative research and development projects that could help propel needed changes in STEM learning. This description overview of the DRK-12 portfolio is the fifth and final portfolio overview to be prepared by CADRE. The report describes important characteristics of the first six cohorts of DRK-12 projects that received their initial funding from 2007 to 2012 and characterizes the development and research in STEM education—on resources, models, and technologies—funded by the DRK-12 program. Each DRK-12 project has formative and summative evaluation, which are different from the project’s own R&D activities and instead should support and measure the effectiveness of those activities. This paper discusses evaluation options for investigators and evaluators to consider. To foster knowledge use among policy makers or practitioners requires a substantial effort that invests in sustained interaction and enlists a range of supports for the prospective knowledge users. This paper discusses some options for more effective dissemination efforts that could lead to knowledge use. This compendium of measures is Part II of a two part series to provide insight into the measurement tools available to generate efficacy and effectiveness evidence, as well as understand processes relevant to teaching and learning. Part I looks at teacher outcome assessments, and Part II looks at student outcome assessments. The purpose of this compendium is to provide an overview on the current status of STEM instrumentation commonly used in the U.S and to provide resources for research and evaluation professionals. Part 1 of a two-part series, the goal to provide insight into the measurement tools available to generate efficacy and effectiveness evidence, as well as understand processes relevant to teaching and learning. It is focused on instruments designed to assess teacher practices, pedagogical content knowledge, and content knowledge. This overview is intended to describe the scope and depth of research and development DRK-12 has funded and to identify areas that could be advanced by further investigations by CADRE. The overview summarizes the 248 projects that met the criteria for inclusion and analysis. This brief suggests practical ways of engaging teachers and other “end-users” in projects that develop materials for education in the areas of science, technology, engineering, and math (STEM). Projects described in this brief have benefited from school, district, and state users serving as Co-PIs, advisory board members, co-developers, implementation managers, data collectors, professional developers, and project emissaries to the broader field. The brief describes how K-12 end-users and decision-makers are instrumental for developing materials that will be adopted, implemented with essential fidelity, sustained at classroom and organizational levels, and scaled within and to new organizations. This collection of New Measurement Paradigms papers represents a snapshot of the variety of measurement methods in use at the time of writing across several projects funded by the National Science Foundation through its REESE and DRK–12 programs. The collection is designed to serve as a reference point for researchers who are working in projects that are creating e-learning environments in which there is a need to make judgments about students’ levels of knowledge and skills, or for those interested in this but who have not yet delved into these methods. Based on the lessons of education practitioners, researchers, and developers who have partnered on R&D projects, this tool is intended to help others assess and improve their own R&D partnerships. The tool includes a worksheet that prompts reflection and discussion as well as tips for starting and sustaining a partnership dialogue. This paper argues that reciprocal arrangements between R&D and practice can have intellectual merit as well as practical value. Specifically, it describes the benefits of education research and development (R&D) arrangements and policies that is centered in practitioners’ purposes and environments, that exploits a multi-stage process of development, that attends to organizational and community contexts, and that builds cumulative knowledge across projects and studies. Based upon business scholarship addressing organizational constraints and opportunities for new approaches to R&D, it acknowledges the education R&D might benefit from considering analogous ideas. CADRE conducted an analysis of the projects within the NSF’s DRK-12 portfolio studying ELLs to better understand how the work supported by the program is advancing our understanding of ELLs’ learning in science and mathematics. The study was designed to answer three research questions: who is being supported by DRK-12 to do this type of research, what are they studying, and how these projects are contributing to the field. 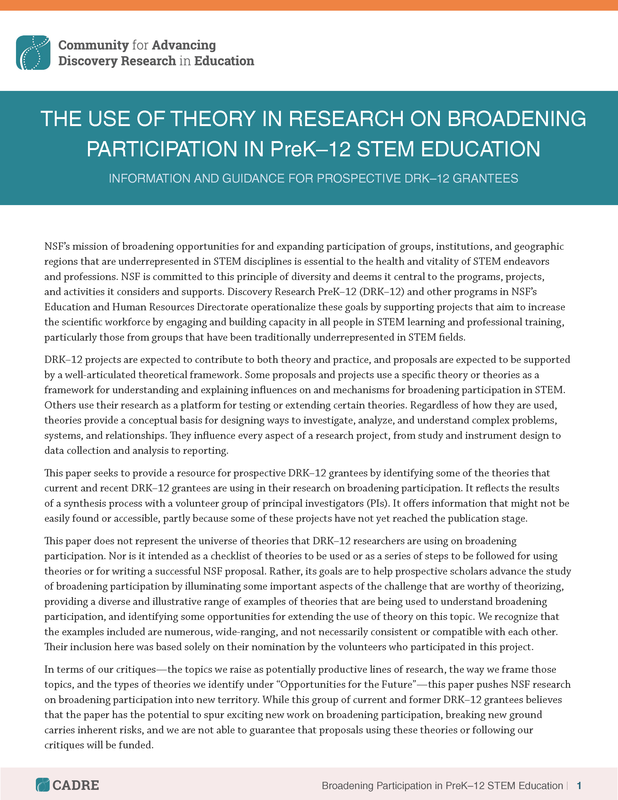 Produced by NSF-supported researchers and developers, this practice brief makes a case for substantive partnerships between STEM education researchers or developers and the districts and schools where the R&D takes place. Partnerships can enhance the quality, relevance, and usability of project outcomes, with implications for the sustained and scaled use of project knowledge. Written for an audience of fellow researchers and developers, the brief summarizes what the authors have learned about creating and maintaining partnerships, as well as potential pitfalls and challenges. This paper argues that DRK-12 grantees can enhance the long-term consequences of their work by using insights from research on dissemination. Projects at all stages, from early design work through completion, can benefit from an awareness and understanding of the challenges of knowledge use. In reviewing lessons from research on dissemination, this paper addresses not only communication strategies for disseminating findings, but also the sustained engagement of potential users as partners throughout the R&D process. The research studies reviewed here placed dissemination in the context of knowledge use. The goal of this report was to provide an overview of the DRK-12 projects that have a focus on assessment. Twenty-four percent of the projects in the portfolio are conducting research on or developing an assessment. The report summarizes key characteristics of these projects.